I created a Starz tribute page on Facebook and before I knew it, I was friends with Starz guitarist Bobby Messano´s ex.first wife who introduced me to Mr.Bobby Messano himself.When I was young, I listened a lot to Starz classic albums "Violation" and "Coliseum rock" - I still think the riffs on the instrumental "Coliseum rock" are among the best riffs ever written.I´m honored to present to you, Bobby Messano in person for an exclusive interview for melodic.net! Danielle McKee rocks big time,she?s not at all like Avril Lavigne and Michelle Branch that many might wanna compare her with. This former background vocalist for Nelly Furtado puts up a big wall of hardrocking guitar riffs mixed with megacatchy pop choruses delivered in a big budget production. A contender for my top 20 album list 2005. David McMillin is one of the unsung heroes of 2008 with his brilliant album, Heartsteady. We wanted to know a bit more about him, and here is the result. Garfield Mayor is a new talented artist from the Great Britain, he has potential of going far, just listen to his strong debut "Take and take" and I think you will agree.Garfield jumped aboard the melodic.net cybership and talked about how it was working with Kylie´s producer, going out on tour with Rob Thomas of Matchbox Twenty and a few words about Michael Jackson. M&R Rush is a cool AOR band in the late 70ï¿½s style from the same town as classic AOR bands like Survivor, Styx and REO Speedwagon - Chicago. 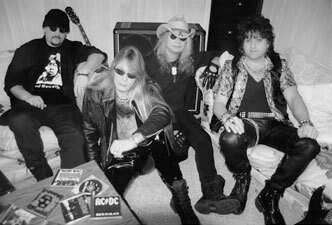 The band started in the 70ï¿½s but went on hiatus in the late 80ï¿½s, in 2004 they returned with the comeback album "Thrill of the chase" and this year they gave us the brand new album "Keep on rockin". Canada's Marianas Trench have just released their new album "Ever After" that is their best album up to date and also a milestone in the progressive pop genre. Think Queens in a millennium version and we got a band that got all chances to make it really big! We got the chance to ask the band some questions and here it is….. If you are into melodic rock and will buy like 5 albums this year, Mercy Fall?s "For The Taken" is definitely one of those. With great songs from start to end and a massive production ala Howard Benson,their album is a real pearl.I had to talk to one of nicest guys in business, the vocalist Nate Stone about the album etc.Enjoy! Michael Schenker's Temple of Rock release their new album "Spirit on a Mission" in Europe on March 20th. More info: www.michaelschenkerhimself.com Prior to what comes soon we had the chance to do a short interview with him. Quality,ladies and gents! is the keyword when it comes to intelligent progressive rock and it seems drummer/keyboardist/producer/composer Daniel Flores knows exactly the importance of quality when it comes to writing music with parallels to AOR,pomp and progressive rock. Get to know Mr. Big vocalist Eric Martin's funniest moment while being on tour and much more in this special interview.